It's been five years since Ryan's father died, but Ryan is philosophical about these things because she is a Cubs fan. And being a Cubs fan means having to deal with 100 years of loss and dashed hopes. For Ryan, rooting for the Cubs will always be linked to spending time with her Dad. On the anniversary of her father's death (which also happens to be Opening Day), Ryan finally musters the courage to return to Wrigley Field and revisit the site of her memories. While there she meets Nick (a boy from school that she barely knows) who is drawn to Wrigley for similar yet different reasons. With Nick, she is destined to learn new lessons about struggle and hope. I'm not a sports fan (if I had to root for a baseball team, it would be the Phillies) and I'm even less into novels written in the third person (which this one is). So, I figured that I would simply hate this book, but I don't. That should give you an idea of how great this author must be. But Smith is much more than the writer of a good book, she is a phenomenal spinner of words. 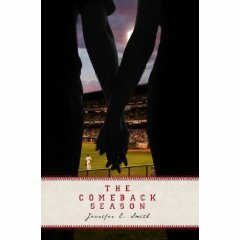 Using baseball as an analogy of life is hardly new, but she takes it much further than I've ever seen before - combining good observation with a way to make you sit back and nod. This is a beautiful book with a lot to say about life. Even if sports are not your thing, this is a book that is well worth your time to read.